What Type of House Should You Call Home? Choosing a design for your new home involves a lot of questions. These can be things like how much space does our family need or what sorts of features would make our everyday lives better? Detached or attached garage? The list of needs and wants for your new home can be a large one. It's an important choice because the home model you choose will affect the price but you also want to ensure you choose the best floor plan for your family. The following descriptions of various home designs will help you figure out the best option for you and your family. A two-storey single-family home offers a tremendous amount of common space on the first floor for active, social family members to enjoy with each other and friends. Typically, these are open floor plans, with the kitchen, nook, and great room all open to each other for more socialization. The second storey will have a master bedroom, two (or more) standard bedrooms and often, an additional room. sometimes called a bonus or flex room, to use as needed. Many people use this as the family room, keeping the great room downstairs as the "fancy" room ;). You could also turn it into a kids playroom, a home office or gym - you have a lot of options! This is the case with our Hayward design. It also has an open first floor that invites family members to chat freely, sharing the events of the day. The nice thing about this particular model is that you have a flex room on the main floor that is closed off but you also have a bonus room on the second level! The design of this home provides a family with two storeys of space as well as a verandah out front. Our Westbury design has a covered front verandah, which is attractive to families who love to spend time relaxing outdoors and enjoying the breeze from a comfortable chair. This is also a two-storey home, however, as a result of the design, it has a little less square footage than a traditional two-storey. This also means they come in a lower price point, so this style of home is very appealing to a new family who don't quite have the budget for the "big" house yet. The interior layout offers the same sort of conveniences as any single-family home, such as an open kitchen for preparing delicious holiday meals a full master suite with ensuite bath, two secondary bedrooms and the laundry room located on the second floor. A duplex is a home split into two units, offering separate entrances for two families and sharing a single wall. This can be desirable to families with busy lives looking for a spacious, yet affordable home. Duplexes are also a great choice for those who might consider buying both units and becoming a landlord by renting out the other unit. Others might enjoy having their elderly parents living in the unit attached to their own, allowing them to stay connected while still maintaining their own space. 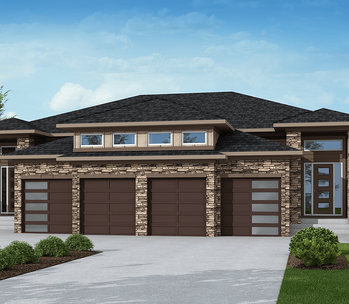 With several bedrooms and gathering areas throughout the space, families will find all they need in our Hillside model. In addition to the three large, comfortable bedrooms, you have an open, airy kitchen that features an island. Some of the exceptional features of this model are the covered front verandah and the rear deck. A bungalow home design only has one level (but sometimes can have a basement developed as well). 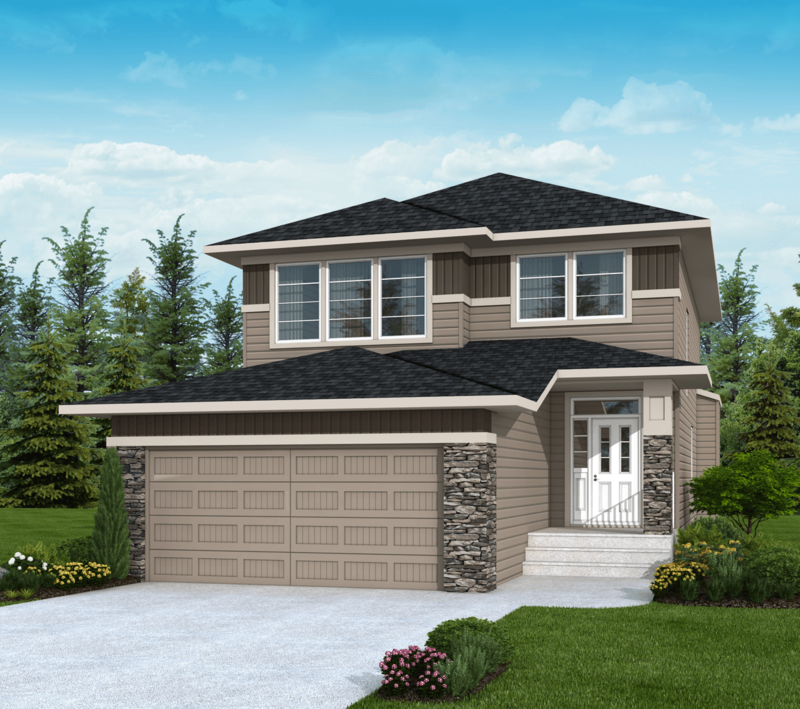 The bungalows duplexes, offer the same benefits as mentioned above. A bungalow duplex could be perfect for retired couples or young families as a starter home. 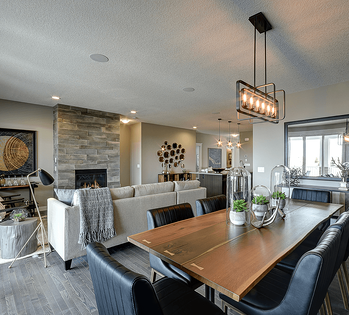 You'll still have the advantages you would get in a single-family home, like a large, open concept living area with plenty of space for visiting or even hosting gatherings. But you also get to experience the benefits of bungalows! Our Devon model has 9' ceiling, so the single level still feels vast. It has two bedrooms located off to either side of the main floor to ensure privacy, a back deck, and the option of a lower level to provide more visiting space. A villa is similar to the bungalow duplex we described above. However, these villas have extra conveniences – such as fully developed lower levels and fully landscaped yards and fences – for low-maintenance homes with lots of space, and lots of luxury for families or retirees. 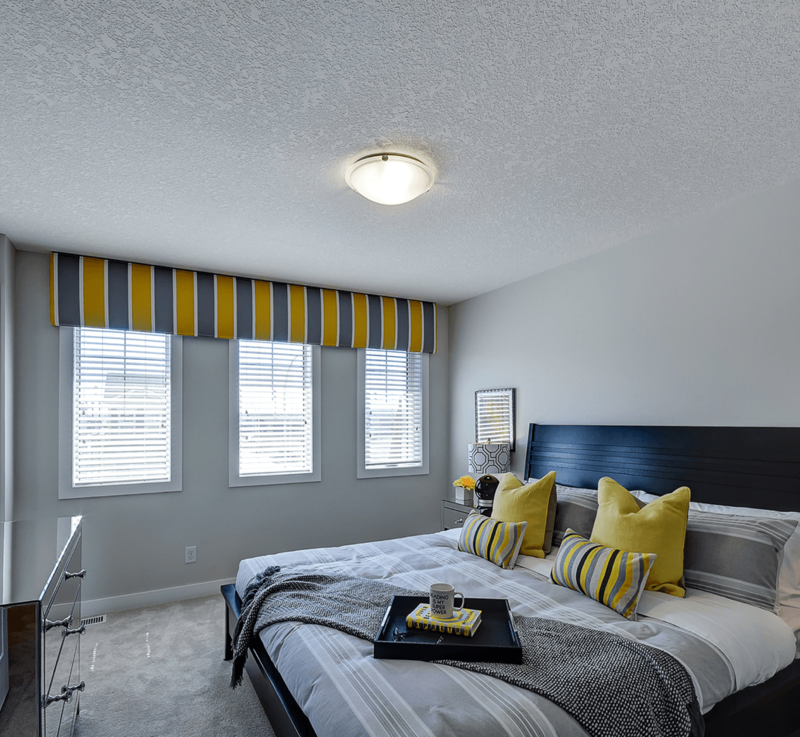 Our Saffron design has two bedrooms on the main level; the master suite and a secondary bedroom, plus two full bathrooms (one of those being the ensuite with a free-standing soaker tub). On the lower level, you have two more bedrooms and a media room. The covered deck and kitchen island with a breakfast counter are perfect for those who love to spend time with friends. In your search for the right home design, you'll also have to decide between front-attached or rear detached garages. The decision between these two options depends on how many cars you own, what type of shelter they need, and what sort of design you prefer. Consider the pros and cons of detached versus attached garages. The design of an attached garage is just what it sounds like. It’s connected to the home and you can enter it without going outside. This design allows you to get into your car without walking through the rain or snow. You have quick access to your car anytime you need it. One of the disadvantages of an attached garage might be the engine noise echoing into the home when a car pulls into the structure and, for some, it could take away from your home's curb appeal. A detached garage is not connected to your home but sits nearby, usually at the back of the house. One of the advantages of having a detached garage is elevated curb appeal, and if you use your garage for other purposes (such as for a workshop) it can be nice to keep that noise away from your home. Also, many people like the bit of extra exercise they get by walking to and from their detached garage! A detached garage is not as easily accessible as an attached structure. In addition, you have to go outside into the rain or snow to reach your car or anything else you need from the garage. Sometimes, sitting down to make a list of the features you want in a new home can help to clarify what you’re looking for. You want to live in the home for several years, so it’s best to take your time to take into account what you need now, and envision what you're going to need in the future. 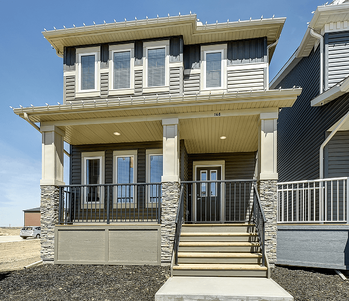 Feel free to visit any of our show homes to get a better idea of exactly what you’re looking for. Originally posted Oct 31 2017, updated Feb 12, 2019.